Kreate With Me 2: DH's Valentine....maybe!! I had a very productive day yesterday and just need to come up with a few more layouts for Thursday's project. Wish me LUCK!!! My card for today is for an old sketch challenge on SCS. DH was supposed to get this last year, but he blew it BIG TIME!!!! He's been a total Sweetie for quite some time now so he just may earn this card on Valentine's Day. I'm keeping my fingers & toes crossed that he doesn't do anything to totally tick me off so I don't have to make him another *ugly* card LOL!!! His facial expression was quite priceless last year and my response was simply"You Earned This!!!" I'm off to exercise, get things finished for tomorrow's class, do more laundry and quite possibly do some challenge cards. Thanks so much for stopping by and have a great rest of the day!! This is gorgeous! He's gonna love it. I'll just bet that "ugly" card last year wasn't really "ugly" at all! It's below 0 and snowing here. We've already got over 5 inches on snow on the ground. The high tomorrow is to be ONLY -2 and THAT's in Chicago! I'm in the far west burbs which means 5-7 degrees colder. YIKES! Sounds like you're staying warm! That's good. What a lovely sparkly card. I hope it gets it and that is hilarious. I'd love to see the card he got last year. That is too funny that DH got an "ugly" card last year!! This one is quite beautiful...love how the warm colors work together! Ohhh I like your thinking Jackie-if they are in the dog house to give them an ugly card! That is too funny! I really like this card...love the hearts. Snort! Hope he earns your beauty of a card this year -it's too pretty not to be shared!! So are you dug out yet today? I can't believe there was school. The snow at the bus stop was up to my knees from the drifting. I'd love to see last year's ugly card. That made me laugh. This is really cute. I hope you get your catalogs today! If they would have gotten here earlier yesterday I would have brought one over. I didn't get to open them until after 7. Oh what a gorgeous creation!! I love your sparkly hearts!! :) TFS! Awesome Valentine!I love all of your layering! Love your card! Hope he earns it! Jackie, you are too funny!! I hope hubby stays in your good graces for at least the next month so he can get this beautiful card!! Beautiful! Love the papers, the sketch and the glittery hearts. How do you get that cool green logo "see my work on splitcoast" that takes you to your gallery? That is so cool! 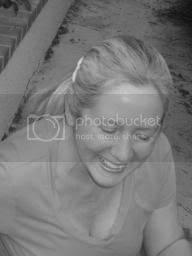 Jackie, I couldn't help but chuckle at your story! I hope your DH is good enough this year too! LOL! you know I'm going to have to go back in your blog to last Valentine's day to see the ugly card you made! Love the card. I hope hubby earns it! This is way to gorgeous to not give it away - even if he doesn't deserve it! LOL. I like the glitter hearts and the crystal effects dots. I don't even bother making my hubby cards anymore. He looks at them once then they get buried in his sock drawer. Love those sparkling hearts!!! Here's hoping that hubby will get to see this sweet card this time! LOL!!! I say post last years card. I love this one makes me think of chocolate. I had to giggle - sometimes no matter how much I love the dh, there just isn't a garbage can big enough for him!! lol I am sure he thinks the same way about me sometimes. Very sweet card, Love the bling. This is just lovely, Jackie! Beautiful creation and design! This is awesome Jackie!!! Love it!!! This is a beautiful card, Jackie!!! I am sooo glad you have everything under control...heeheehee!!! If he gets in trouble, just send me that gorgeous creation, I'll be good, I promise!!! 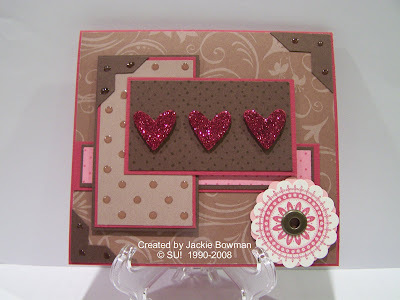 Fabulous card, i like the glittered hearts. Hmmm....I'd like to hear the story behind THAT story! I love the hearts on this, gonna have to case this! What a lovely card! I hope your husband treats you well enough to earn this card for this year!